Got a question or comment about CityTours in Krakow? Ask a Travel Expert! Leave Krakow for a morning or afternoon to visit the UNESCO-listed Auschwitz-Birkenau Museum. This sobering half-day trip will have a lasting impact, commemorating the lives of those who died in the extermination camps during the Holocaust of World War II.Auschwitz-Birkenau is the best-known cemetery and place of genocide in the world. 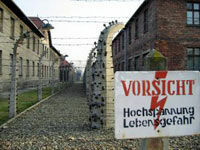 Started in 1940 as a concentration camp for Polish political prisoners, in 1942 the camp became a center for the extermination of European Jews. During the years 1940 to 1945, approximately 1.5 million people died there. The majority of the camp's victims were Jews, along with Poles, Gypsies, Russian POWs and members of other nationalities.Your tour of this haunting site begins onboard the coach with a 15-minute documentary about the liberation of the camp. On arrival at the museum, your guide will show you the exhibitions in some of the surviving prison blocks, the gas chamber and the crematorium. After a short break, the tour continues to Birkenau, where the view from the watchtower above the entrance gate reveals the forbidding expanse of the biggest Nazi concentration camp built during the Holocaust. A Martyrdom Museum was set up here in 1947, and in 1979 Auschwitz-Birkenau was added to UNESCO's list of World Heritage sites.Special Offer - Price displayed includes a discount of 13% off the recommended retail price - BOOK NOW! Click here to find out more about this deal! Leave Krakow behind and spend a fascinating morning or afternoon touring the legendary Wieliczka Salt Mine, one of the oldest salt mines in Europe. Along with the mine's historical importance, its carvings of fabulous figures, monuments and altarpieces have earned the Wieliczka Salt Mine a place on the UNESCO World Cultural Heritage list.Legend has it that the salt mines were part of the dowry of the Hungarian princess, Kinga, when she married Boleslaw the Shy over 700 years ago. 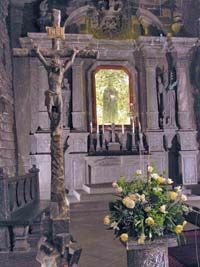 You'll tour the richly ornamented Chapel of the Blessed Kinga and visit an underground salt-mining exhibition on Level 3.Your guided tour takes you from 210 to 440 feet (64 to 135 meters) underground, passing through galleries and chambers on three levels. The guided walk consists of 20 monumental chambers joined by 1.5 miles (2.5 kilometers) of pathways.Entering the Wieliczka Salt Mine, you'll descend a 380-step staircase to Level 1. Although this walk is not strenuous and can be undertaken in ordinary footwear, it will need to be considered when booking this tour. The last stop on your visit to the mine is the souvenir shop and snack bar. From here, a lift carries you back to the surface.Special Offer - Price displayed includes a discount of 13% off the recommended retail price - BOOK NOW! Click here to find out more about this deal! Experience a ride up a funicular railway to the top of Mt. GubalÃ³wka and take a walk around the peak. Visit the oldest part of Zakopane with its old mountaineer cottages and ash trees. Experience the true Zakopane atmosphere when you walk along KrupÃ³wki.Nestled at the foot of the spectacular Tatra mountains, Zakopane is the winter sports capital of Poland and its most famous resort. During the winter, plentiful snow and challenging runs make for excellent skiing while the summer months offer hikers mountain lakes, glacial valleys and waterfalls. The mountains are also home to a unique and diverse range of flora and fauna.Your tour starts with a ride up a funicular railway to the top of Mt. GubalÃ³wka to see a wonderful view of the Tatras.After a short walk around the peak, return down the funicular to visit the oldest part of Zakopane where the old cottages of the mountaineers still stand, surrounded by ash trees and blackened by the sun. These wooden houses and churches were built in the Zakopane style by the remarkable Polish artist, Witkacy.In addition to the traditional mountain architecture, magnificent folk costumes and jewelry have also survived here to this day. To better experience the true Zakopane atmosphere, take a walk along KrupÃ³wki, the central mall, lined with restaurants, cafes, boutiques and souvenir shops. Here you will have a lunch break.The last stop in Zakopane is either the Tatra Museum or, on the way back to Krakow, a visit to the lovely old wooden village of ChocholÃ³w.Special Offer - Price displayed includes a discount of 13% off the recommended retail price - BOOK NOW! Click here to find out more about this deal! For over a thousand years, Krakow has been the center of science, culture and art in Poland. Come and see for yourself upon boarding the Krakow City Sightseeing Tour by Coach. You'll see the likes of Wawel Castle and Cathedral, the Rynek GlÃ³wny, Main Market Square and St Mary's Church. It's a fine introduction to this historic city!Your tour begins with a short walk along the streets of the former Jewish district of Kazimierz. Next, Wawel Hill, crowned by Wawel Castle and Wawel Cathedral and the seat of royal power up until the 17th century. The Castle was home to many Polish kings and queens and the royal crypts in the Cathedral their final resting place, along with several other Polish heroes.A walk up Grodzka street leads you to the heart of Krakow, the Rynek GlÃ³wny, or Main Market Square. There the large Gothic Cloth Hall is the perfect place to shop for local souvenirs.The last sightseeing stop is the twin-spired St Mary's Church with its famous medieval altar by Wit Stwosz and where, every hour the brave trumpeter of Krakow still calls out his warning.Special Offer - Price displayed includes a discount of 13% off the recommended retail price - BOOK NOW! Click here to find out more about this deal! 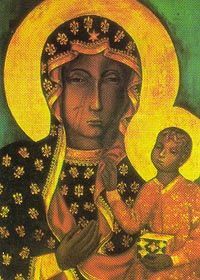 Follow the Eagles Nest Trail to Czestochowa to see the "Black Madonna", a Gothic painting of Our Lady at the monastery of Jasna Gora. Returning to Krakow you will stop at the Renaissance Castle in Pieskowa Skala which is home to the Museum of the National Wawel Art Collections.In the city of Czestochowa is Poland's national shrine and the icon which has drawn pilgrims from across the globe for centuries.The monastery of Jasna Gora is home to the miraculous "Black Madonna", a Gothic painting of Our Lady, which after Rome, Lourdes and Mecca makes Czestochowa one of the most important pilgrimage destinations in the world today. Your visit to the monastery includes the Miraculous Picture Chapel and the Basilica.Also, you can visit the 600th-Anniversary Museum, the Arsenal and the Treasury on your own, if you wish, while others on the tour have a break for lunch and buying souvenirs.Your journey back to Krakow takes you along the Eagles Nests Trail, an historic strategic system of watchtowers and castles. Today most of these are in ruins. However, not all of them have been destroyed completely and you will see some that have managed to endure the rigors of time.On the way back from Czestochowa there will be stop over in Pieskowa Skala to visit a well-preserved Renaissance Castle along the Eagle Nests Trail. High on a cliff over the valley of the Pradnik river, this 14th century fortification was rebuilt in the 16th century as a Renaissance residence. Today it is home to the Museum of the National Wawel Art Collections.Special Offer - Price displayed includes a discount of 13% off the recommended retail price - BOOK NOW! Click here to find out more about this deal! 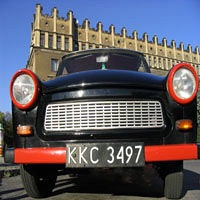 The best way to tour the lovely city of Krakow is in a Trabant, the classic Eastern Europe car. You'll experience the real Krakow on this lively tour, and visit parts of the city that go unnoticed by most visitors, in the company of your young and enthusiastic guide.Krakow is an old city, even by European standards, and one of its greatest assets is the fact it has never been razed throughout its long and tumultuous history.After being picked up in a genuine Trabant automobile, your tour begins with a visit to the Nowa Huta district, Krakow's famous communist enclave. Originally a gift from Stalin, the working-class quarter boasts some classic communist architecture. Your guide will share first-hand accounts of what it was like to live behind the Iron Curtain.Next, you'll visit the city's historic burial mounds, some of which date back to pagan times. The mounds were built as a memorial to Poland's most famous leaders and provide great panoramas of the city. 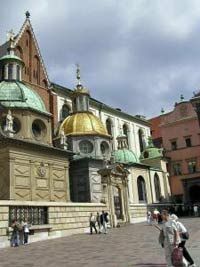 From this vantage point, your guide will point out some of Krakow's more unusual landmarks.The tour ends with a trip to Krakow's Jewish quarter. After being razed by the Nazis during World War II, this area is slowly being revitalized and is now home to the city's artist community. It's lined with great pubs and cafÃ©s, and you will definitely want to come back later to enjoy Krakow's authentic nightlife. Click here to find out more about this deal! Undoubtedly Dunajec River Gorge is one of the Poland's prime tourist attractions and this great day trip from Krakow gives you the chance to admire some amazing scenery as you float down the river, as well as a visit to Niedzica Castle in the Dunajec Valley.Begin your excursion with a visit to Niedzica Castle (also known as Dunajec Castle), originally built in the 14th century by the Hungarians to protect an important trade route through the Dunajec Valley. The castle towers over a large water reservoir with an impressive dam built in mid 1990s. While visiting the castle you can admire the delightful view over the artificial lake and learn the amazing story of Inca refugees who found shelter here.After your visit of the castle, continue to Sromowce Nizne to board your wooden raft to drift at a leisurely pace along the Dunajec River. The river runs from northern Slovakia to southern Poland and is at its most picturesque passing through Dunajec River Gorge. Your adventure down the winding Dunajec River offers breathtaking views of mighty limestone cliffs plunging into the water and stunning native flora, you may even spot some rare bird species such as the Black Stork. Your highly experienced guide ensures you have a smooth ride, pointing out the sights along the way and teaching you the history of the gorge. Your 2 to 3 hour voyage ends 15 kilometers later in Szczawnica. It is advisable to bring suitable rainwear or a sun hat depending on the weather. Click here to find out more about this deal! Our tour meets in the largest medieval square in Europe, the main market square of Krakow. After an introduction on Krakow's origins we lead our guests to our shop to equip each person with their own Beachcruiser bike. Our tour takes you through a time warp of history and architecture, where you will find remnants of a history over 2000 years old.We bike pass a 900 year old market before beginning the tour under the statue of the Battle of Grunwald. From there we ride along the Planty gardens to the Jaggiloninan University, where we walk inside the medieval courtyard and listen and watch as figures representing Queens of Poland's history chime the hour. We continue our journey to the Bishop's Palace for a glance at the famous window of Pope John Paul II, before glimpsing the old residence of Oscar Schindler. And what tour would be complete without a stop at the Wawel castle as well as the Dragon dwelling. Take pictures as the dragon breaths fire just for you!Now its time for a relaxing ride along Krakow's Vistula river before entering the Krakow Ghetto. See remnants of the Ghetto wall before having the opportunity to enter Oscar Schindler's factory and sign the guest books, therefore adding your name to Schindler's list. See remnants of Krakow's historical Jewish quarter known as Kazimierz. By this time your appetite has grown enough to enjoy a Polish meal in a traditional Polish restaurant. Choose anything from wild boar to perogi dumplings to Paradise beer, the restaurants original home brew.We begin our journey back from the restaurant through the bar saturated areas of Kazimierz, before we follow the royal route from behind the castle all the way to the resting area of Poland's only Leonardo De Vinci, Lady with Ermine, and we then end with a stop in front of an architectural marvel, the Slowacki theater. We stress that you do not have to be fit to do this tour. 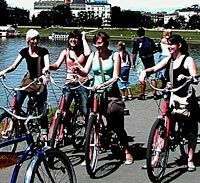 Krakow is completely flat and ideal for bike riding. Click here to find out more about this deal! While in Poland don't miss your chance to visit Wadowice - childhood home of John Paul ll. Travel through the stunning Beskidy mountain range, pay homage to the Sanctuary of Divine Mercy and visit the Archbishop's Palace on this intriguing tour from Krakow.Travel from Krakow and through the Beskidy mountain range with a visit to Wadowice, childhood hometown of John Paul ll, previously the Krakow archbishop Karol Wojtyla. You will see the house where the he was born, pass the parish church, where he was baptised, and places of interest that had an effect on him during his childhood and adolescence years. Before you return to Krakow you will stop at the Sanctuary of Divine Mercy in Lagiewniki. The sanctuary is situated some four kilometers south of Krawkow's central Old Town historic district and is a developing place of pilgrimage that you can pay homage to the holly relics of St. Faustyna Kowalska, who was canonized as the first saint of the Third Millennium by John Paul II, and admire the impressive modern basilica consecrated by the Pope in 2002.Then travel to the foot of the Royal Castle to visit the Archdiocese Museum located in the most picturesque street of Krakow. In the museum you can see the flat where Karol Wojtyla lived while working as a lecturer of theology.Finally, visit the Archbishop's Palace which is Wojtyla's last residence before leaving for the Vatican in 1978. See the famous "papal window", where thousands of people lit candles and prayed during his last days. Tour ends with drop off at Krakow city center,Special Offer - Price displayed includes a discount of 14% off the recommended retail price - BOOK NOW! Click here to find out more about this deal! The Wall may be over and done with, but many of Krakow's most famous communist artifacts are alive and well!Visit Nowa Huta, the district that still bears testament to the power of the Soviets. Most notably, your guide will lead you on a in-depth tour of the place that was originally given as a gift to Krakow by Stalin himself! These labyrinths of the tenements were done in imitation of the renaissance and meant to be a model communist city. 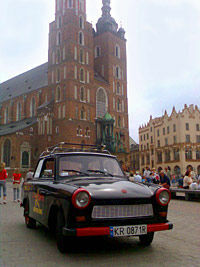 It later became one of the centers of the revolution and resistance within Poland, leading to the eventual overthrow of the Communist government.This guided tour is complete with transportation in genuine Trabant automobiles - cars manufactured by the Eastern Bloc specialists. During your 2.5 hour tour, your young and energetic guide will lead you through this one-of-a-kind city and up to the gates of the steel mill that was originally in the heart of this district.Upgrade to the Communism DELUXE Tour in Krakow (4 hours):The Communism DELUXE Tour upgrade is a must-do for any visitor to Krakow! This tour was recently made famous by travel documentary maker Michael Palin after his feature in 'Palins New Europe' series in 2007. Also recommended by the BBC, Reuters, New York Times, Lonely Planet guidebooks and many others. An extended version of the standard Communism Tour in a Trabant automobile, the Communism Deluxe tour includes a trip to a Communist-era restaurant and guided visit to our private museum. Explore everyday life in Poland in the 1970's in our exclusive and unchanged Communist apartment. This deluxe tour includes the rare opportunity to eat pickled cucumbers and toast times past with Communist relic, Mr. Vieslav (upon request). You can also try your hand at driving the trusty Trabant. Enjoy lunch in an authentic Commie milk bar canteen. Click here to find out more about this deal!